Victoria and Thunder Ridge are traditionally known for toughness and physical play. The Knights have a streak of 12 straight postseason appearances, the longest current run in eight-man football. Thunder Ridge has made the playoffs every year since 2009 and has just five losses in the last four falls. This year, the teams have again remained in top-five in Eight-Man, Division II and both squads are 5-1, 2-0 in district play. 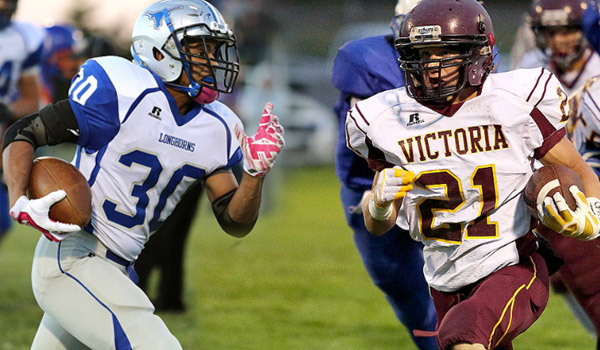 Victoria, Thunder Ridge and Beloit St. John’s-Tipton (4-2, 1-1) form an elite triumvirate in District 7. However, the teams have delivered another strong season through vastly different ways – and match up this Friday in a critical contest in Victoria. Thunder Ridge has a massive, experienced offensive line with senior end Noah Billings, senior center Logan Miller, junior left guard Jordan Gering, senior right guard Tanner Shaffer and sophomore end Brayden Hale. Thunder Ridge averages 57.3 points per contest. Senior tailback Trent Rietzke has 1,300 rushing yards and 28 TDs, including 40 carries for 354 yards in a big win against Northern Valley last Friday. He has back-to-back 1,000-yard seasons. Victoria coach Doug Oberle called Rietzke one of the best eight-man running backs he has ever seen. On the other side, Victoria has averaged 45.7 points and 375 yards a game behind a smaller, quicker offense. Junior quarterback Brady Dinkel has passed for 486 yards and seven scores and rushed for 522 yards and nine scores, including a big game in a 68-56 road win against Beloit St. John’s-Tipton last week. Victoria has won 11 straight home contests. Senior Bryan Dome has more than 550 all-purpose yards and has taken two kicks back for scores, part of five non-offensive TDs for Victoria. Dome has four long kickoff returns, one apiece in the Knights’ toughest games. Oberle calls his special teams “really, really good” this year. Senior end Noah Dreiling, and juniors Lane Kisner, Taylor Corley and Joe Dortland and Eric McAlonan are among the offensive threats. Victoria has used multiple formations this season, instead of its usual option. McAlonan played fullback last fall, then moved to center this year and played some fullback and center last week and had a five-yard carry. Voorhees said he has never seen such versatility like McAlonan. Thunder Ridge has had multiple personnel changes, but like the Knights, have won five in a row. Thunder Ridge lost to Osborne, while Victoria fell to Central Plains, both top five teams in Division I. Starting safety/tight end Gavin Taylor (injury) won’t play Friday after he’s produced a solid season. Voorhees said Taylor has been Thunder Ridge’s “jack of all trades” and has played several positions, including backup tailback. Senior fullback/middle linebacker Laramie Boyle, a returning starter, has missed multiple games because of non-injury reasons, but will play Friday. Rietzke turned his ankle at Wednesday’s practice, but is expected to play. Two weeks ago, Victoria defeated Northern Valley 46-0, but last week Thunder Ridge beat Northern Valley 84-58. Northern Valley ran a 4-2 defense and a spread offense, but different looks than normal for the Huskies. Northern Valley also forced Thunder Ridge outside, which allowed Rietzke to have another big game with his 40 carries. Voorhees likes to keep Rietzke around 20 carries and that’s occurred except for last Friday. Thunder Ridge ran plenty of speed option, lead option, toss and isolation plays outside. Plus, the Longhorns had their third string fullback.